Objective: The aim of this study was to determine whether tri-cortical iliac bone autografting provided extra benefit for the stabilization in Sanders Type 3–4 calcaneal fractures fixed with locking plate. Materials and methods: The study included 29 calcaneal fractures (Sanders Type 3/4=15/14). 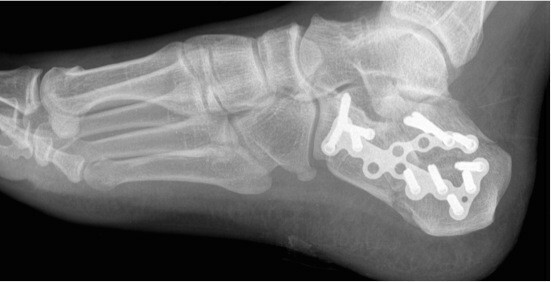 All fractures were fixed with locking plate using the extended lateral approach. Bone grafts were used in 16 (Group A; Sanders Type 3/4=7/9) and not used in 13 (Group B; Sanders Type 3/4=8/5) calcaneal fractures. As a grafting material, only tri-cortical iliac crest bone autograft was used. All operations were performed by the same surgeon. The same locking plate was used in all fractures. Calcaneal height and angle of Bohler and Gissane were measured in early postoperative and final control radiographs in both groups. Clinical evaluations were performed using the American Orthopedic Foot and Ankle Society ankle hind foot scale. Results: There was no difference between the groups in terms of clinical results. Radiologically, the degree of change in Bohler’s angle, Gissane’s angle, and calcaneal height was not different between the groups. Conclusion: Bone grafting does not affect the clinical and radiologic outcomes in Sanders Type 3–4 calcaneal fractures fixed with locking plate, and they provide no extra benefit to the stabilization. We think that fixation using locking plate is adequate and there is no need for bone grafting.